Conceptually, it is a hybrid, owing its origins to both prehispanic Aztec philosophy & religion and medieval European ritual practice. Scholars trace its origins to indigenous observances dating back hundreds of years and to an Aztec festival dedicated to the goddess Mictecacihuatl. In ancient Aztec ceremonies, both children and dead ancestors were remembered and celebrated. The Aztecs would bring offerings of food to altars in honor of the dead. They would also place small clay images that were supposed to represent the deceased on these same altars. When the Spaniards arrived in the 16th century, they brought the Christian Holiday of All Soul’s Day with them. This was a Roman Catholic holy day commemorating the dead in general as well as baptized Christians who were believed to be in purgatory. Spanish priests were quick to see a correlation between the Aztec and Christian celebrations so moved the Aztec festival from summer to fall so that it coincided with All Souls’ Day. This was done in the hopes that the Aztec holiday, which the Spaniards considered to be pagan, would be transformed into an acceptable Christian holiday. The result of this cultural blending is an event where modern Mexicans & other Latino cultures celebrate their ancestors during the first two days of November, rather than at the beginning of summer. Through art, music, and ritual this event honors ancestors and celebrates the vitality and richness of today’s Latino community. And while the ceremony remains true to its Latino roots, the holiday has spread throughout the world, being absorbed within other deep traditions for honoring the dead. Customs in Central America vary from town to town. It is usually a combination of rituals and introspection that ultimately takes on a joyous tone. When celebrated abroad, the holiday takes on its own unique flare in each community. In Brazil, Dia de Finados is a public holiday that many Brazilians celebrate by visiting cemeteries and churches. In Spain, festivals and parades are frequently held and people often gather at cemeteries and pray for their deceased loved ones at the end of the day. Similar observances occur elsewhere in Europe, and similarly themed celebrations appear in many Asian & African cultures. In France and some other European countries, All Souls’ Day was observed by visits of families to the graves of loved ones, where they left chrysanthemums. 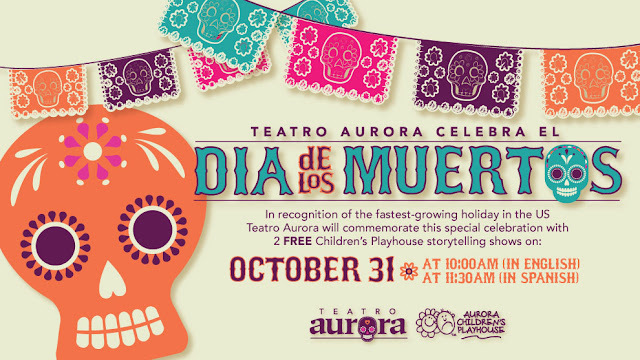 At Teatro Aurora, we celebrate Day of the Dead as a reminder that theatre, culture, and arts are for all people. Day of the Dead altars are built during Dia de los Muertos as memorials to honor the lives of loved ones who have passed. They are often quite beautiful creations, constructed with love and care. On top of the altar, offerings are laid out for the dead — known as ofrendas in Spanish. These are items that the spirits will enjoy when they come back to earth to visit their living families and friends. People make an effort to lay out the best ofrenda they can afford, consisting of things the dead person enjoyed while s/he was alive. We encourage our people of all origins in our community to participate and bring the favorite artifacts of their deceased, such as copies of photos, favorite games, snacks, or drinks. Join us for a special edition of Children’s Playhouse, as storyteller Tersi Bendiburg takes us on a journey of remembrance as we celebrate life and those who have come before us on: October 31 at 10:00am (English) and 11:30am (Spanish).